While most attention is put on the violin, the violin bow plays an important role in violin playing too. Just like the strings, the violin won’t sound great if it misses the violin bow, or a lousy one is used. Here at Violin Music School, we would like to provide you a complete guide to learning more about the violin bow and how to choose one that is suitable for your violin playing. 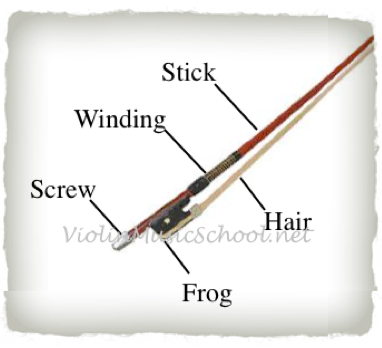 A picture showing the parts of a violin bow. One should focuses only on the violin bow wood and the hair, both which makes all the difference in a bow. Pernambuco wood today is a rare type of wood used for making top quality, high performance level bow. The wood is harvested from Brazil’s forests, and shipped to Europe and North America for manufacturing of bows. However, the wood is becoming so scarce that organizations and foundations pledge to save the wood from extinction. Carbon Fiber bows are the next preferred choice for the bow stick as pernambuco wood bows become more rare and expensive. Carbon is a natural product that is strong and resilient. It has recently gained much recognition from professional violinist. They cost a fraction of the price of a pernambuco bow. Brazilwood is used for making cheaper bows , usually for beginner violin players. They are resistant to wear and tear, hence, suitable for starter violinists. They are way cheaper than a pernambuco or carbon fiber bow. Quality of bow hair makes a significant difference in how the violin music will sound. For years, white horse hair has been chosen as the best material for bow hair. The best horse hair is believed to be taken from horses in northern climates, especially Mongolian horsehair, as it has more friction. When choosing a bow, one should not solely focuses on the price of the violin bow. A high priced violin bow doesn’t equate to a top quality bow. Likewise, a lower priced bow doesn’t mean its a lousy one. Hence, it would be wise to study what are the qualities to look out for, in choosing a good bow for your violin. First, we have to know what wood and bow hair is the bow made of. As we have learned above, Pernambuco is the best choice for bow sticks. However, if pernambuco is too expensive for you, you can consider carbon fiber bow, which has been rapidly gaining ground over last 10 years. Brazilwood bows are mainly for beginner violin players. Horse hair is also preferred for violin bow hair, then any other materials. You know the bow can bounce? Simply tighten the bow hair, face the hair on your wrist, and tap the hair on your wrist. Feel the vibrations on the bow. This is a way to tell if the bow is lively, and able to vibrate with the strings. You want a bow which is able to cling on to string and vibrate along with it, especially for off-the-string strokes like spiccato and richochet, and on-the-string strokes like legato and detache. A lousy bow can only skate on the strings. Get the right balance for your bow. It shouldn’t be too light at the tip, or too heavy at the bow frog. The correct bow balance allows you to execute different bow strokes with ease. Camber, the slightly arched shape you see at the curve in the middle part of the bow, is important as it gives the bow the strength needed for playing. However, too much or too little camber hinders the bow from doing its best. A new violin bow is usually made straight, when looked down the shaft from the frog. But after much playing, the violin bow stick tend to bend to the right. Hence, this might make the bow difficult to control, and may produce unwanted squeaks while playing. Thus, its important to check the straightness of the bow when you buy, and fix or replace it when it’s crooked. While most of the emphasis is placed on the price of the violin, a top quality violin bow is able to command thousands of dollars too. While most violinists purchase bows for playing, there are some musicians who buy violin bows for collection and investment. Are you looking to buy an expensive bow, for playing and collecting? Maybe you want to know what are the factors that determine the price of a violin bow. Below are the 4 questions you have to ask. First of all, we have to look at the condition of the bow. The condition of the bow is all that matters for the high price it commands. A bow that is slightly cracked or damaged, even if it’s been repaired, will have lost almost 90% of its value. If you’re investing in a bow, do check its condition thoroughly. But if you’re a violinist who considers buying a bow of top quality material, but lacks the funds, you can consider refurbished bows (fine bows which have been fixed), as they cost lower. Where Is The Bow Made? Just like expensive violins who have their famous violin makers, violin bows have theirs too! While Italy is famous for their violins, France is famous for their violin bows. Bows made by the French tends to cost more than bows made elsewhere. However, again, do note that you do not necessarily need a high price violin bow to enjoy great violin playing experience. How Often Is It Played? While some expensive violins command higher price even after being played for years, this doesn’t reflect on violin bows. In fact, value of violin bows depreciate with frequent playing. Unlike the violin, the bow can wear out without ever being broken or cracked. Hence, bow collectors hardly use their prized violin bows for playing. However, if you’re not into re-selling your violin bow for profits, it doesn’t really matter. Decorative designs can be seen on violin bows, sometimes unique to the violin bow maker. Some bow makers even include precious metals and ornaments (gold, sterling silver, ivory) in the bow, usually at the violin bow frog. The winding of the bow can also be made of silver or gold plated metal wires too. While the expensive ornaments and metals do raise the price of the bow, it doesn’t means it’s the best bow for playing. Do try the bow, and experience it on your violin. While you can purchase violin bows at your local violin shops, you can also purchase them via reputable online sites. Check out our Violin Music store for your desired violin bows! Got your bow? It’s time to learn how to take good care of your precious violin bow! Also, learn how to clean your violin bow to regain its freshness after much playing! Glad to know you from the website.This is Sara.I saw the violin bow on your website.They are beautiful.I bet they are popular in your market place. Our factory is located in Anping,Hengshui,China. It has 31 years’ history.We supply 4″-48″ horse hair. Our product directly export to United States,Janpan, United Kingdom and many other countries.I believe our products will satisfy you and your customers. Quality of bow hair makes a significant difference in how the violin music will sound. If you are in need of horse hair,please feel free to contact me. It is highly appreciated of your kind reply. Hi Sara! Thank you for visiting our page, and sharing your information about the violin bows your company makes. I’m sure we will be able to showcase your bows on our website in the near future!